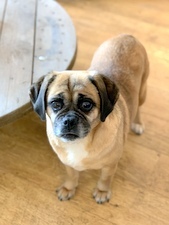 17-01-2019 Cubby is a 6 year old female ex breeding puggle. 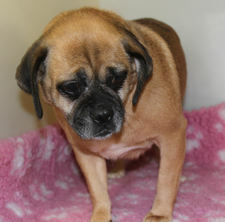 Cubby is a sweet, gentle girl who has an inguinal hernia that our vet will be addressing. Cubby has never lived in a home before and needs to be pampered and loved. Cubby will need a resident dog to help her as she will watch and copy what they do which will help her with house and lead training. 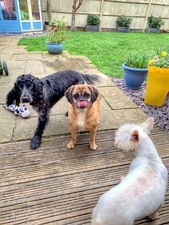 This is a whole new world to Cubby - one she has never seen before so time and patience will be needed but the reward you get will be an amazing and faithful little friend. 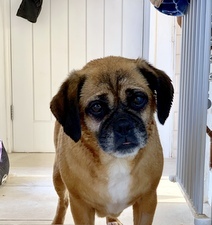 Cubby is so full of untapped personality she does not know what to do next ... she longs to be with you and near you and other dogs in our home but she’s still very hand shy, this is fine as she likes to take treats direct from you,the cuddles will come. She loves the garden - she likes stealing things like gardening gloves and remote controls from a coffee table! She LOVES other dogs, the more the merrier as far as Cubby is concerned, she’s even started answering to her name. Cubby is VERY led by food which is excellent as she will have the desire to learn so much in exchange for chicken. 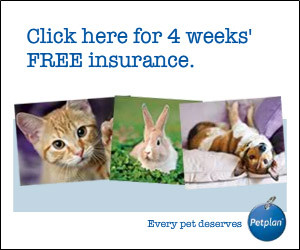 We’ve not started lead training yet, we will start on Monday. 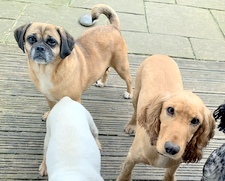 Cubby has got the most gentle and lovely personality emerging andshe’s very good at her toilet training if she gets into a routine quickly,she is a very fast learner. Cubby’s never had toys but she does love newspaper to rip up and also loves household objects like dustpans and brushes, we got her some as her own toys and she carries them about and is learning to leave other household items alone. She barks with delight at breakfast and dinner time. Cubby loves other dogs and cubby loves sleeping .. she snores VERY VERY loudly !! !